Amor - Sinking Into A Miracle. Vinyl LP. Bleep. 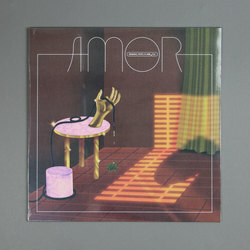 The individual members of Glasgow foursome AMOR are no strangers to sonic exploration, with an impressive tally of pop, rock and experimental releases to their names. Following two 12” single releases of New York loft party, jam-flavoured dance music, debut LP Sinking Into A Miracle is a sharpening of those sensibilities into an ecstatic good-time manifesto. ‘Glimpses Across Thunder’ recalls the vocal quality of a young David Byrne, with the searching eye of James Murphy.